How can I use Jedox Mobile in my company? a Jedox Suite account for your company. the native Jedox Mobile Client Application. You can download the Mobile Client Application using the app store for your mobile device. For more information, see Installing Jedox Mobile Client. If you want to test Jedox Mobile, you don’t need the Jedox Suite. You can just use the ready-to-run sample applications in the Jedox Cloud Demo setup, which are included with the Mobile Client. How does the connection to Jedox In-Memory Database work? 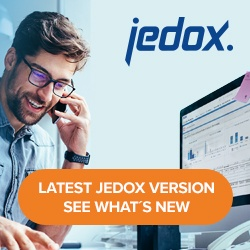 The Jedox Mobile application uses Jedox Web as a proxy to connect to the Jedox In-Memory Database server by using an http or https connection. To use Jedox Mobile via UMTS or Wi-Fi (internet connection), the Jedox Web instance has to be accessible for Jedox Mobile without any preceding proxies or security portals. Only transparent proxies (proxies that aren’t recognizable by Jedox Mobile) are allowed to redirect the connection to Jedox Web. The data stream may not be filtered in any way in this case (e.g. cookie blocking). Firewall settings may need to be adjusted to allow a direct connection from Jedox Mobile to Jedox Web. How many cubes can I access? There is no limitation. A connection is always made to one Jedox In-Memory Database server during one session. All databases and cubes available on this server can be accessed. Can I change the layout of the Jedox Mobile Ad-Hoc Reports? You can change the color of the microcharts in the Grid View. Additionally, you can change the colors of the charts by setting the according key/value pair in Jedox Web’s settings. See the Theming section in the article Settings for Jedox Mobile for more information. You can change the point of view in Ad-Hoc Reports by tapping the Edit button or the Filter button in the top-right corner on the Ad-Hoc Reports screen. For more information, see Mobile Reports & Documents. All data is stored in Jedox In-Memory Database Cubes on the Jedox In-Memory Database Server instance accessed by Jedox Mobile. Documents (PDF, PPT, etc.) can be stored offline on the device in a dedicated, secure app storage if you opt for storing login credentials during login. How is Jedox Mobile secured? See Jedox Mobile – Security for more details. Tag your reports with phone or tablet, according to the device type your report is optimized for (see Tags in Jedox Mobile for more details). Additionally, you can deactivate the Filter by device option in the Jedox Mobile settings. You can also change the group or the hierarchy to the location where you put the reports you want to see. See the Group / Hierarchy Selector section in Jedox Mobile Navigation for more details. When you create a new account and enter the account credentials, the app checks in the background if the credentials are already valid. If the number of failed login attempts is limited e.g. by an Active Directory group policy, this may lead to the account getting deactivated. Android: It is possible to deactivate auto-checking the credentials to prevent the account from being deactivated. You can do this when you enter your credentials by long-pressing in the white area below the credential text fields. A red symbol will appear indicating the status of the auto-check. iOS: You can deactivate the auto-check in the new account screen by long-pressing next to the password text field. A popup will appear, prompting you to disable auto validation. I see the Jedox Cloud (Demo) account in the login screen, but I can’t add my own accounts. Tap Switch or create an Account at the bottom of the login screen and select a previously added account. You can also tap Create Account in the following screen. Contact your Jedox administrator to check if you have the rights described in Access Rights for Jedox Mobile for the respective actions. Read Settings for Jedox Mobile for more details on how to change the theme. On the login screen, double-tap with two fingers simultaneously. The log entries are displayed.